You have found the perfect wedding dress, so what about the perfect shoes. Here are eight tips on how you can find the perfect wedding shoes. The quest to find the perfect wedding shoes does not have to feel like a difficult quest. With a few tips in hand, you can find your perfect wedding shoes. There are many options when it comes to shoes and certainly no shortage of places to shop. Wedding Style. A great place to start is to decide what type of shoes will compliment your wedding style. Is your wedding casual, rustic, vintage or all about bling? What is the climate and setting of your wedding? Are you having an indoor or outdoor wedding? If you are having an outdoor wedding you may want to stay away from Stiletto Heel and opt for a Wedge Heel, Flats or Ballet Sippers, which can handle the terrain much easier. If you are having a destination beach wedding, then you may find that open toe shoes or Flip-Flops are the way to go. Remember you can always switch things up and have a different shoe for your ceremony and reception. You can wear heels for your ceremony and pictures, and then swap your heels for flats when it is time to dance. Dress Style. The perfect wedding shoes should compliment your wedding dress. If possible, choose your shoes around the same time as your wedding dress. Having a picture of your wedding dress and perhaps a swatch of your fabric will be a value tool when shopping. If you do not have a swatch of the fabric remember to take note of the colour, type of fabric and details. Is your dress satin, silk or lace? Are there any beading or ribbon details? You should also remember to coordinate with your other wedding accessories. Colour. Do not be afraid of colour. Think outside of the classic white and ivory and consider some other colours that may compliment your wedding. Your shoes can be your something blue or it can compliment the colour(s) of your bridal party or wedding theme. Have fun with colour and create an impact. Your Personality. Start with styles of shoes you already own and what has been comfortable for you in the past. If you have always worn flats, then go with a nice pair of flats. If you are not sure what to look for, spend some time browsing online and collect images of shoes you like. Collect images and narrow down the different details that really speak to you. You will see a pattern in the styles that you are drawn to and you can use this as a guide when you go shopping. Sticking with something that reflects your personality is a great way to ensure you will be a happy bride. Choose shoes that make you feel amazing on your special day. Creativity. You can also take the DIY approach and tap into your creativity. Transform plain shoes into your dream shoes. You can adorn your shoes with crystals, flowers, ribbons or other embellishments. You can also add removable clips for a versatile option. Budget. Those Jimmy Choo shoes might be calling your name, but are you willing to pay the price. When shopping for your wedding shoes consider your budget and try to stick within it. Reusability. Consider something that you can wear again. Your wedding is a special day in your life and you may want to keep your shoes as a keepsake. However, if you are considering wearing your shoe again, then I suggest choosing shoes that are classic and will work for other occasions. Having a beautiful pair of dress shoes can go a long way for attending weddings, Christmas parties and other events. Comfort. Trust your feet, they will let you know how comfortable they are. Keep in mind that the shoes you choose will have to be worn for most of the day, so comfort may be a higher priority than you may think. It is your day and you will want to enjoy it comfortably. An important factor in comfort is finding the right size. Ensure that your shoes fit well, feel comfortable and are pain-free. 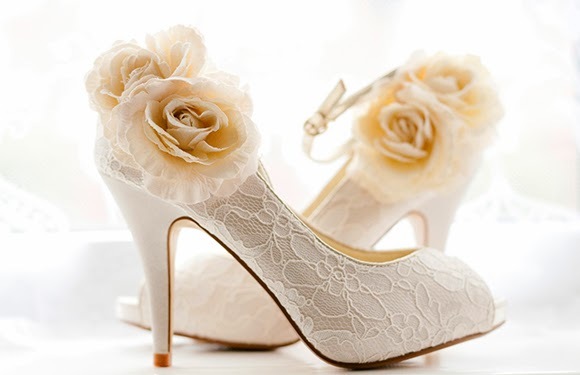 Once you have found the perfect wedding shoes, do not forget to take it with you to your wedding dress fittings. The height of your shoes will impact the length of your dress. You also want to get use to your new shoes by walking around in them and getting a feel for them. This will make them feel more comfortable on the day of your wedding. I also suggest that you wear the shoe at various times during the day to account for slight changes in your feet. Now you are ready to say, "I do" to the perfect shoes. Have fun!